Andrew McLeod kicks the ball upfield. The junior defender has started all. Thirty-three days. That’s how long it’s been since Northwestern won a soccer match. 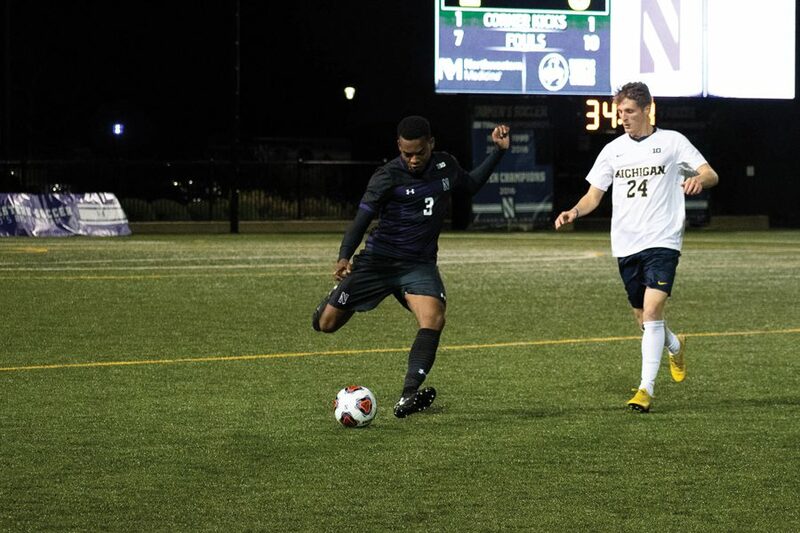 After the Wildcats (4-5-4, 0-3-2 Big Ten) played to a 1-1 draw against their city-rival DePaul on Tuesday, NU will take a road trip to Piscataway, New Jersey to face Rutgers on Friday. Heading into this weekend, the Cats have not won a game in their last seven attempts. Fortunately for NU, the Scarlet Knights (2-9-1, 1-4-0) have not been claiming many victories this season. Despite being ahead of the Cats in the conference standings, Rutgers has only won two games all season. After losing to Notre Dame 3-0, coach Tim Lenahan said his team needed to play well down the last stretch of its season to consider it successful. Since Lenahan conveyed that message to his team, the Cats have played better, but the results fail to show it. In their last two games, they have played two double overtime games that ended in draws. Against Penn State, sophomore goalkeeper Miha Miskovic said the Cats’ high possession numbers limited the chances the Nittany Lions earned. All season, NU has struggled to get possession of the ball and take shots. However, the Cats have started to find their rhythm offensively. NU has taken 34 combined shots in its last two games against Penn State and DePaul, after taking just 34 combined shots in their six games prior. NU has been creating a lot of opportunities to score and, most importantly, has been keeping pressure off of the defense, something that has plagued the Cats all season. NU’s defense will look to slow down Rutgers’ forward Jordan Hall. Hall is leading the Big Ten in goals and points with nine and 19, respectively. Even going up against a potential Big Ten Player of the Year candidate, Miskovic has a lot of experience and the defense has played well this season. The Cats are allowing an average of one goal per game and Miskovic has put up seven shutouts so far this season. Lenahan has had nothing but high praise for the play of his defense and the coaching of assistant coach Michael Casper, who aids the team on the defensive side of the ball.